We’re thrilled to announce that “Visions of Warriors” will be screening at the University of California, Irvine on Tuesday, 5/28/19, from 6:00 p.m. to 8:00 p.m. We’re deeply honored to screen our documentary at one of the leading universities in the country, where many of our family and friends have attended. The screening is presented by the UCI’s Sue & Bill Gross School of Nursing, Center for Medical Humanities, and Office of Inclusive Excellence. Thank you to the Adey Nyamathi, the Founding Dean & Distinguished Professor of the Sue & Bill Gross School of Nursing; the Sue & Bill Gross School of Nursing; Danilo Caputo; the Center for Medical Humanities; Doug Haynes, the Vice Provost for Academic Equity, Diversity, & Inclusion; the Office of Inclusive Excellence; Karen Heath; and UCI for this incredible honor. Special thanks to Adey Nyamathi for all her support for our film. 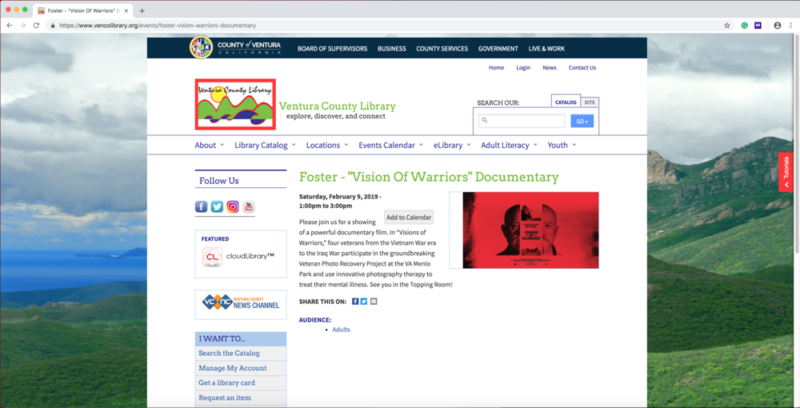 We’re thrilled to announce that “Visions of Warriors” will be screening at the Woodward Park Regional Library in Fresno, CA on Tuesday, 4/23/19, at 6:00 p.m. This library is part of the extensive Fresno County Public Library system, which offers Veterans Resource Centers at their Central Branch Library and Betty Rodriguez Branch Library. 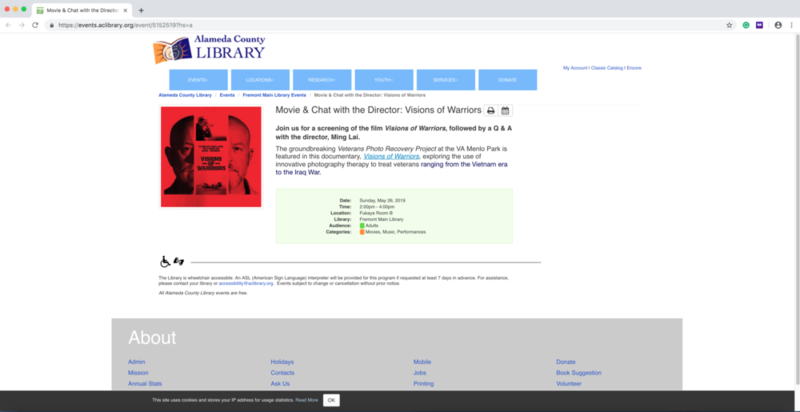 This screening is made possible by “Californians: Community Conversations with Veterans,” a partnership between the California Center for the Book and Veterans Connect @ the Library. The library’s community partner for this screening is CalVet (California Department of Veterans Affairs). According to their site, “CalVet strives to ensure that its veterans of every era and their families get the state and federal benefits and services they have earned and deserve as a result of selfless and honorable military service.” Ryan Gardner, the clinical social worker who’s featured in the documentary, and Ming Lai, the director, will be attending the screening and participating in a Q&A afterward. Thank you to Jessica Hall, the Woodward Park Regional Library, the Fresno County Public Library, Annette Wholaver, CalVet, and the California Center for the Book for this huge honor! Special thanks to Martha Vungkhanching and California State University, Fresno for helping us to promote the screening.